I really like the dress I finished the other day but the more I looked at it, the more I felt it was missing something. It was just a bit too plain, you know? So, I started rummaging through my embellishments and didn’t find anything but some black bugle beads, meh. 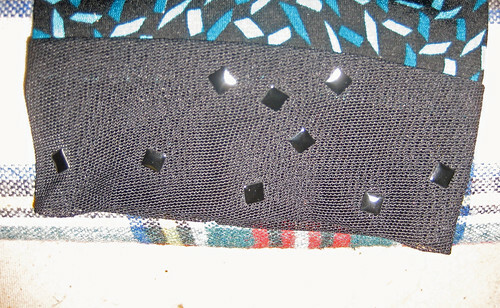 Then yesterday, Karla, Phyllis and I were talking about how to apply hot-fix studs and rhinestones when it hit me: I had a bag of square black 5mm hot-fix studs in my stash! 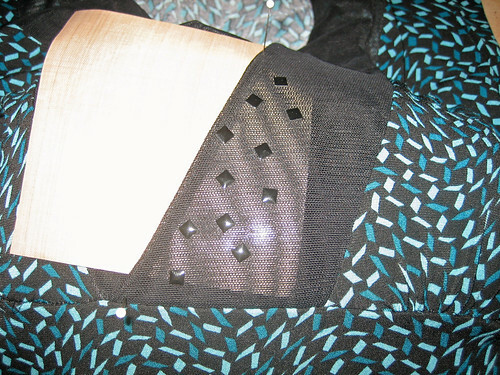 The first thing I did was test them on a scrap of fabric to make sure they’d stick to the Illusion – I once used hot-fix rhinestones on stretch lace and they all fell off! I used the smaller flat tip on my Kandi Kane and cut a small piece of a Teflon sheet to slide between the layers to prevent the glue from bleeding through. 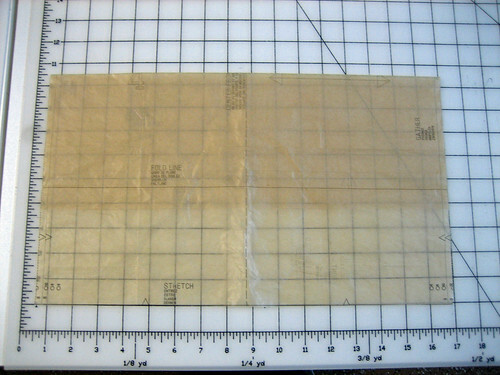 If you don’t want your front and back glued together get a Teflon sheet and use it! Application is really simple. 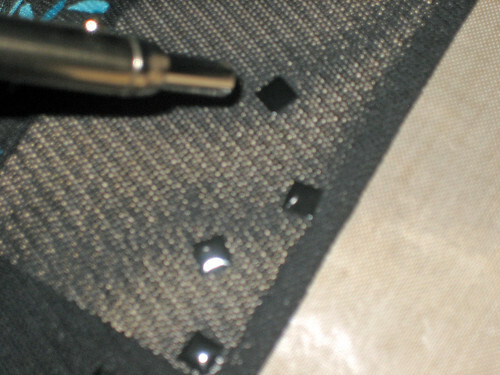 Just lay the studs into position and heat them up with the Kandi Kane tip. I couldn’t find the directions so I just tested and decided to hold the tip on for a count of 15. You will naturally want to press down on the stud with your finger after removing the tip – beware that it is very hot! If you can’t help yourself wear a thick leather thimble (or even an oven mitt) as a metal one might scratch the surface. I concentrated most of the studs at the center front thinning them out towards the top and just sprinkling them around the back. I also sprinkled a few on the sleeves. By this time I was running low and wanted to keep a few in reserve for repairs. I will probably order more and fill this in a bit more later. 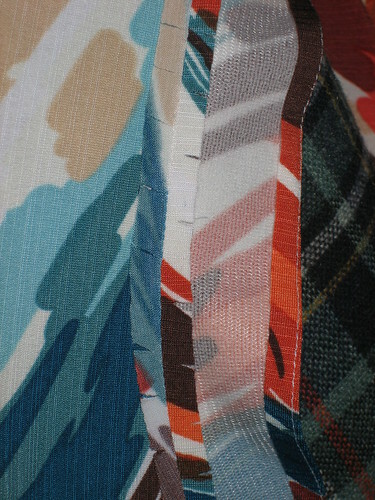 I think they go perfectly with the geometric design of the main fabric and the whole thing took me about an hour. 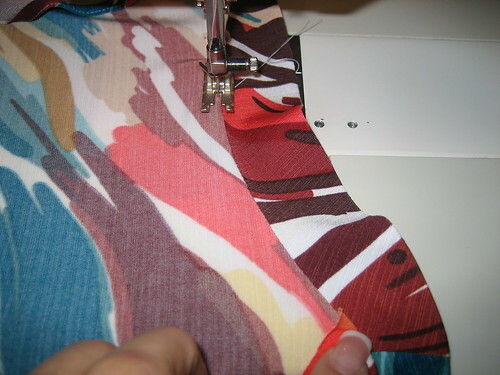 Alterations pants pattern for athletic or full ( aka heavy) thighs front side only. Since a lot of women develop heavy front thighs due to sport activities like swimming, running etc. which cause the front pants legs to be too snug at the upper thighs. 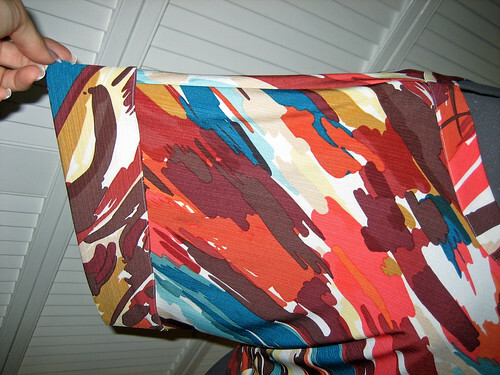 Adding wide to the front pants pattern can help to achieve a better fit. 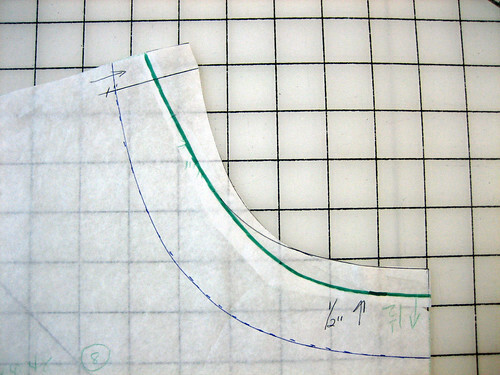 For example, if your patternwidth is 1 inch short in width you can add that amount at the front pattern. 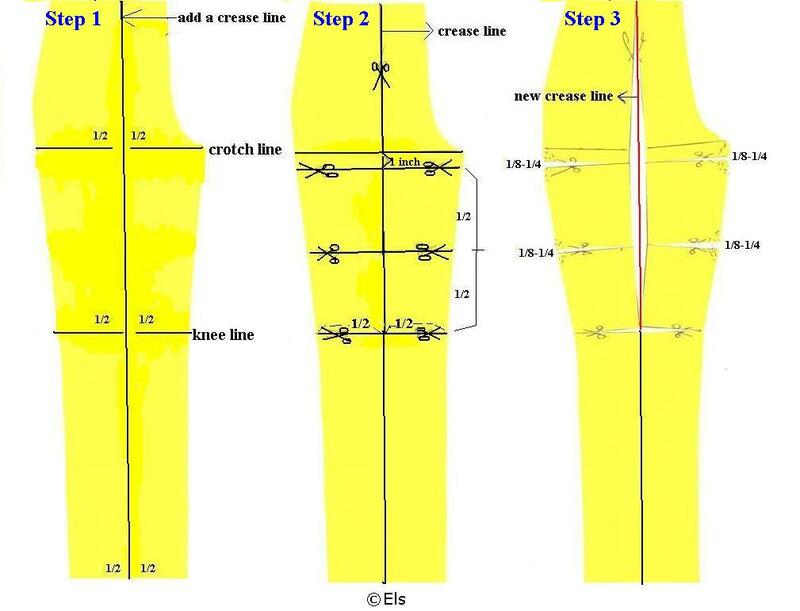 If your pants pattern has a crease line you can start from there , if your pattern doesn’t have a crease line, draw one see step 1 at the diagram. 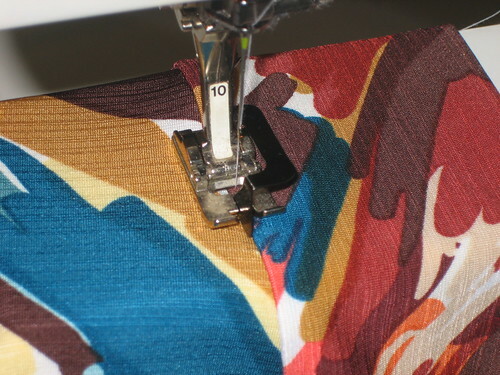 Draw a horizontal line at the front pattern, 1 inch below the crotch line from side seam to inner leg seam. 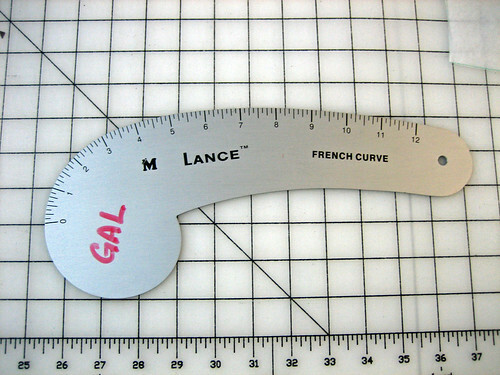 Measure the space between this new line till knee height and divide this in 2 and draw a horizontal line halfway. Draw a new crease line from the knee up to the waist, add at both sides of the new crease line ½ inch at upper thigh .The side seams inner and outer leg are now spread for about 1/8 -1/4 inch. 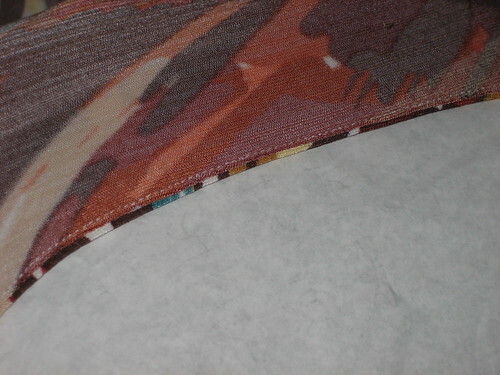 You can ease in those inches (1/8 till ¼ inch) so the front side seam fits the backside seam again. 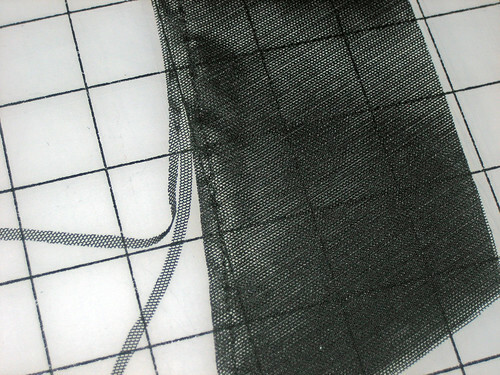 If your front pattern needs more than 1 inch then I would suggest to use a larger size pattern because otherwise the space at inseam and side seam lines are increasing too much and easing in will not be possible anymore. 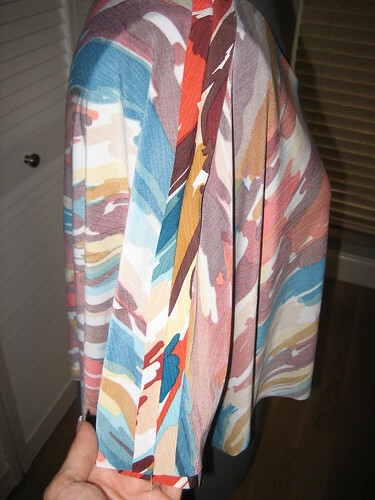 I woke up this morning ready to tackle the Hot Patterns Wong-Singh-Jones Kimono Wrap Dress, other projects in the queue be damned (I know, I think I have adult ADD). I thought about it all day yesterday and couldn’t wait to get started! You see, this dress has been on my to-do list forever. I had it in my head that I wanted to use two solids or a solid and a print but just haven’t found two fabrics that were perfect so I decided to just go ahead and make it in a print for now. I’m sure even the Hot Patterns Team is sick and tired of my endless versions of the Cosmopolitan Dress! A dress version of Jalie 2793 that I cut out months ago. For some reason I just lost interest in it after it was all cut out. I think I was dreading sewing with the stretch Illusion I was using for the contrast. 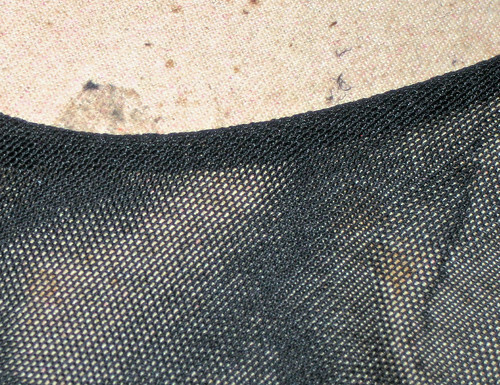 That stuff is never fun to sew, sort of like handling vermicelli (the worm or the spaghetti). 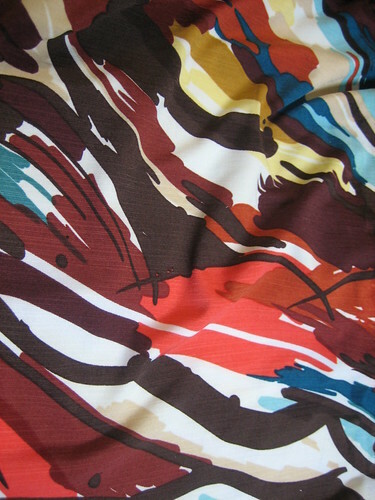 The fabric is a gorgeous rayon/lycra from Textile Studios which made me feel a little guilty. Okay, a lot guilty. So, I grabbed the sad little pile of fabric and continued on my way to the sewing room. I often look at top and dress patterns interchangeably. A top can become a dress and a dress can become a top. 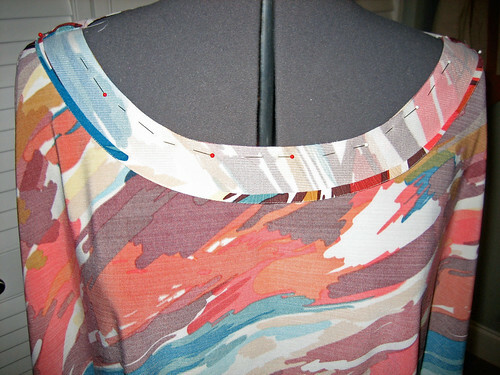 Since this top was already flared at the hip I simply chalked the extra length directly onto the fabric. 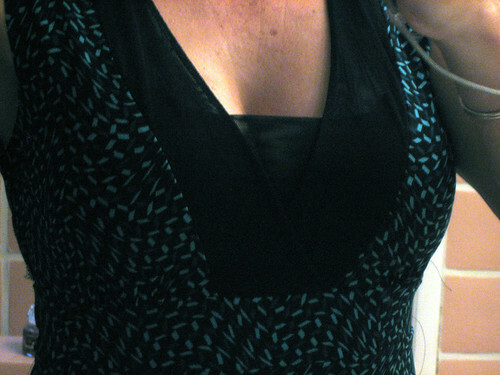 If you are working with a fitted top it’s easiest to pull out a favorite dress pattern and marry the two at the waist. 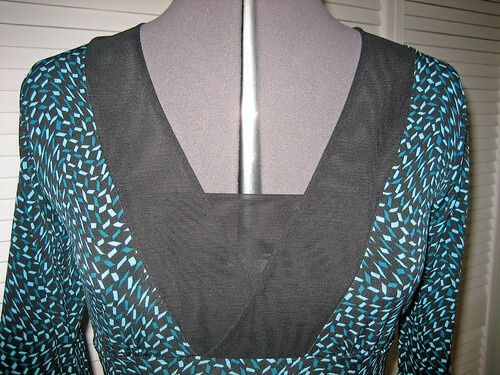 I thought it would be pretty to use black stretch Illusion for the neckline, the modesty panel and the sleeve bands. Awhile back I used it for the bands on this Jalie 2449 top and really liked the effect. And, yes, I sewed all of those little paillettes on individually, by hand. Tedious but worth it. Sewing with the Illusion didn’t turn out to be so bad. 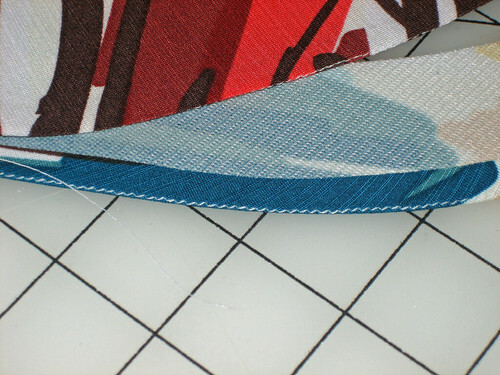 Rather than serging, I used a very narrow zigzag to stitch all of the enclosed seams. 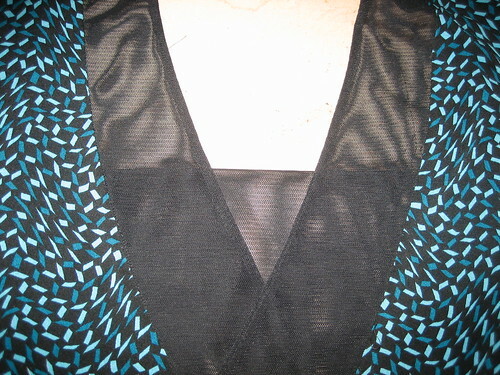 I originally wanted to zigzag over black elastic thread to stabilize the neckline but I didn’t have any and, as it turned out, I really didn’t need it anyway. 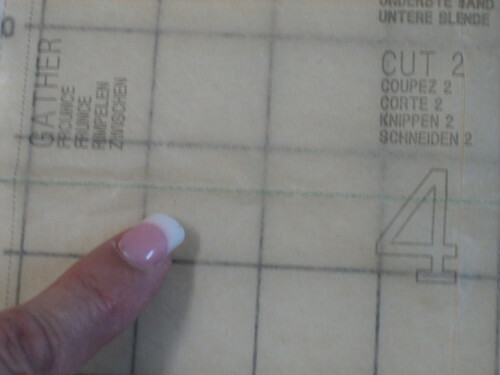 I then carefully trimmed the seam allowances down to 1/8″ with my rotary cutter. In retrospect, I could have used my perling machine. Oh well, I just didn’t think of it! This left me with a nice neat seam. To make it a little easier to handle I machine basted the outer edges together after turning and pressing. 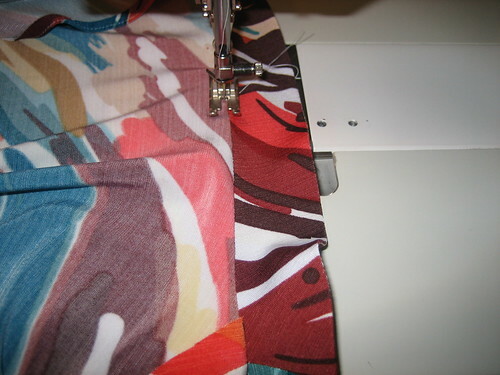 The fabric can be wiggly and I didn’t want anything slipping out of place during serging. Yikes, I really need to recover my pressing board. I debated whether or not the modesty panel was necessary. I decided to go ahead with it because I knew the weight of the fabric would pull the neckline down a bit. During fitting, I was really glad I did! As you can see, this would be pretty risque without the panel. 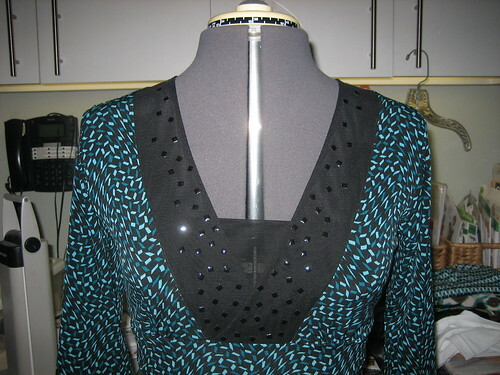 Here’s a better photo on the mannequin – I take the worst mirror pictures of anyone in the online sewing community. 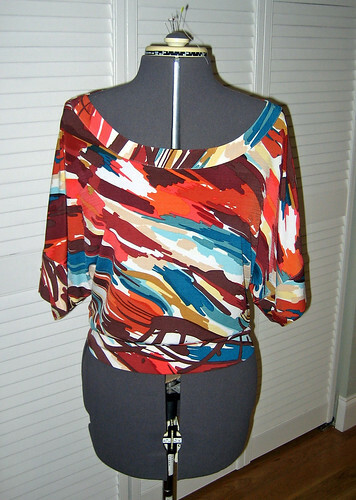 I love the way the Illusion looks on the sleeves! Here’s the completed dress. It needs shortening and hemming but I’m going to let it hang out for a day before I finish up. Doesn’t it always feel so good to complete a UFO and hang a new garment in one’s closet? 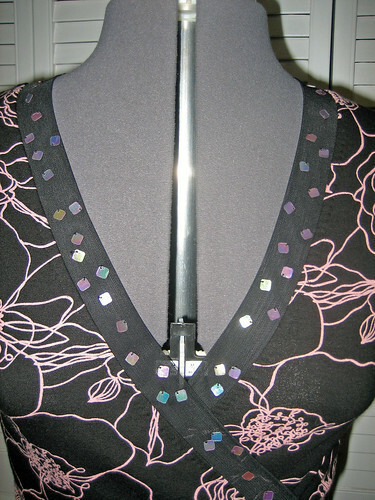 Jan was wondering how to narrow the neckline of this (or any) top so I thought I’d just post a quick photo showing how it’s done. The heavy green line is the original neckline. I do not recommend using markers for your pattern work (messy and the lines are too fat) but the pencil lines wouldn’t show up. It’s a little wonky because I traced over the original line freehand just so you could see it. 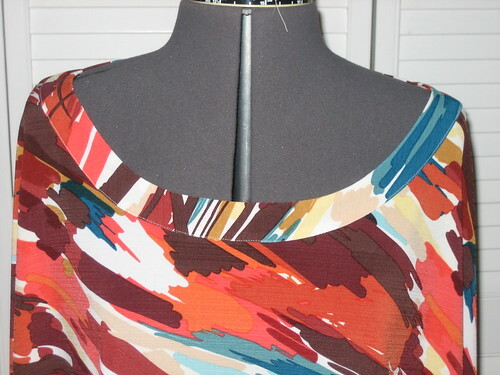 You can see from my notes on the pattern that I brought the neckline in 1″ at the shoulders and raised it 1/2″ at the center front (I had previously lowered it 1.5″ at the center front). The other line you see on the pattern is my facing line. 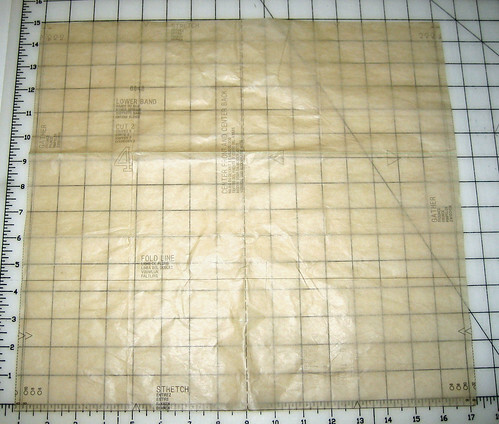 If I plan on using this pattern often I will retrace it onto manila paper. Whenever I retrace or transfer a pattern I always make a note of all adjustments made to the pattern for future reference – usually just numbers and arrows. 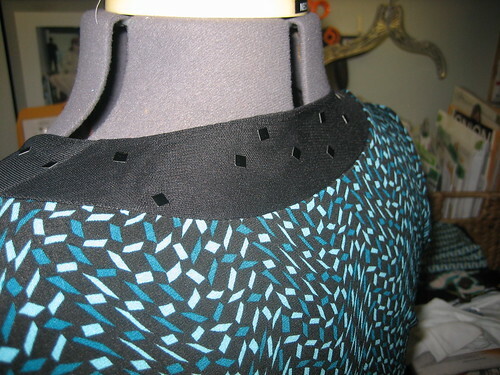 Then I used my mini French curve to redraw the neckline and repeat the process on the back. 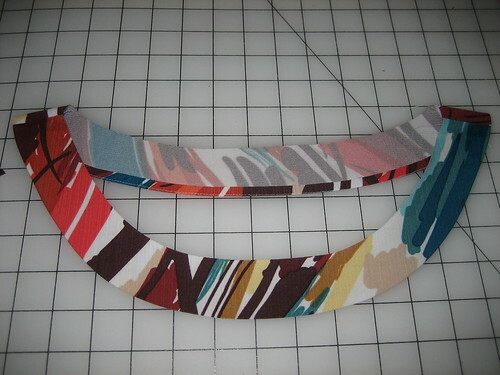 I do have the regular Fairgate French curve but the mini curve is so handy for necklines. I have no idea where to buy these, my friend Cynthia bought this one for me in NYC. I hope that helps, Jan!